For some, mariachi is a way of life in Tucson. Los Changuitos Feos, the most famous mariachi youth group here, express their Mexican pride through folk songs. At a remote desert outpost two hours from Tucson, sheriff’s deputies deal with a grinding daily routine amid the harsh desperation of drug-smuggling and illegal border crossings. Kristian Hernández uses journalism as a way to explore his roots. 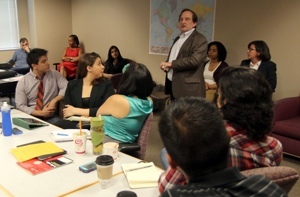 Hernández, a University of Texas-El Paso graduate, has worked with Borderzine, Hispanic Link and the Star Tribune.